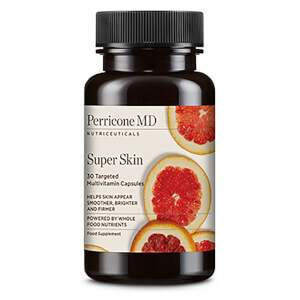 Perricone MD Total Skin & Body combines three types of daily supplements that work to promote healthier skin, hair, nails and body. Provides a 30 day programme. A capsule that combines 16 different nutrients to help improve energy levels and reduce fatigue, whilst supporting a normal immune function and providing antioxidant benefits. Containing Wild Alaskan Salmon Oil, the capsules play an essential role in overall metabolic health and contribute to the normal function of the heart. Provides Biotin, Co-Enzyme Q10 and Grape Seed Extract to assist with antioxidant protection and maintenance of normal hair and skin. Includes 30 individually sealed packets. Each packet contains 2 x Multi Complex Capsules, 1 x Omega 3 Capsule and 1 x Derma Complex Capsule. Take one packet of capsules with a glass of water after a meal, once per day. Multi Complex: Magnesium Oxide, Capsule Shell (Gelatin, Water), Ascorbic Acid, Maltodextrin, Green Tea Leaf Extract Powder, Zinc Gluconate, Alpha-Lipoic Acid, Quercetin Dihydrate, Kelp Powder, Vitamin E Preparation (Dl-Alpha Tocopheryl Acetate, Silicon Dioxide), Bacillus Coagulans, Beta-Carotene Preparation (Gelatin, Corn Starch, Sucrose, Beta-Carotene, Water, Antioxidants: Ascorbyl Palmitate, Mixed Tocopherols), Niacinamide, Magnesium Stearate, Calcium Pantothenate, Silicon Dioxide, Copper Gluconate, Ascorbyl Palmitate, Pyridoxine Hydrochloride, Riboflavin, Thiamin Mononitrate, Cholecalciferol, Folic Acid Preparation (Dicalcium Phosphate, Folic Acid), Alfalfa Leaf Powder, Cayenne Fruit Powder, Turmeric Root Powder, Tomato Powder, Watercress Leaf Powder, Garlic Bulb Powder, Broccoli Powder, Strawberry Fruit Extract Powder, Cocoa Powder, Blueberry Fruit Powder, Eggplant Powder, Purple Cabbage Powder, Tocotrienols, Blackberry Powder, Black Cherry Powder. Omega 3: Wild Alaskan Salmon Oil, Capsule Shell (Gelatin (Fish), Flycerol, Purified Water), Flavouring, Antioxidant: Mixed Tocopherols. Derma Complex: Grape Seed Extract, Astaxanthin Preparation (Dextrin, Haematococcus Pluvialis Extract, Medium Chain Triglycerides, Starch, Gum Arabic, Antioxidants: Mixed Tocopherols, L-Ascorbyl Palmitate; Silicon Dioxide, Glycerol Esters Of Fatty Acids, Sodium Carboxymethylcellulose), Capsule Shell (Gelatin, Water), Microcrystalline Cellulose, Coenzyme Q10, Biotin Preparation (Dicalcium Phosphate, Biotin), Magnesium Stearate, Silicon Dioxide.